In the days following Thanksgiving, you cannot miss the fact that Christmas season has begun, here in the Gatlinburg and Pigeon Forge area of the Smoky Mountains. We are deep in the Winterfest time of year, with millions of Christmas lights twinkling everywhere – strung throughout Gatlinburg, Pigeon Forge, Sevierville and the theme park village of Dollywood. The famous arts & crafts community of Gatlinburg – the largest collection of independent artisans anywhere in America – is back in the Gatlinburg Convention Center offering the perfect transition from Thanksgiving into Christmas. Each year the Thanksgiving Craft Show at the end of November is followed immediately with the Christmas Craft Show in the first week of December. Both shows are free, and provide ample opportunity to pick up unique, hand-crafted works of art as gifts, as well as a chance to talk with the individual artists and watch their live demonstrations of their craft. This year the two shows run from November 24 through December 6, 2015. Here’s our write up from last year of the Thanksgiving & Christmas Craft Show, and the Arts & Crafts website. 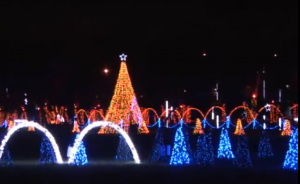 Meanwhile Shadrack’s Christmas Wonderland opened in early November, the famous dive-through field of lights synchronized to music. Stay warm in your car and take the whole family on the short ride to Sevierville for this unique experience, not to be missed. Shadrack will be open every night including Christmas, and will close January 3, 2016. Another seasonal highlight that started in time for Thanksgiving this year is Snow Tubing at Ober Gatlinburg ski area. Take a slide in your own groove carved into the tubing slope at the base of the ski mountain. This is low-impact and high fun for all ages, and hopefully will continue all season until Easter 2016. 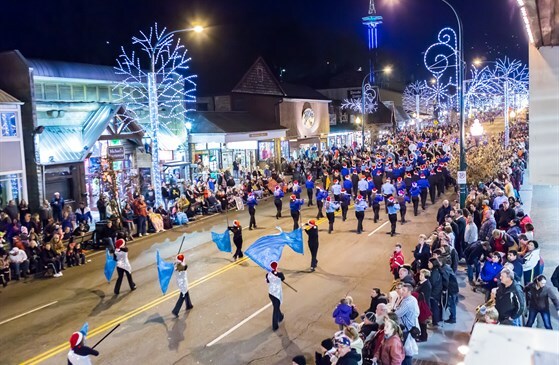 Early in December we’ll see an enthusiastic crowd of around 60,000 people on Parkway in Gatlinburg for the annual Fantasy of Lights Christmas Parade. In 2015 it happens on Friday, December 4, starting at 7:30 pm. Check our Christmas Parade write up from last year for an idea of what to expect. How about some Christmas Bluegrass? December 9-12 in Pigeon Forge, renowned bluegrass and country performers, Lorraine Jordan & Carolina Road will be back again this year in one of the best shows you’ll see all year – even if you didn’t expect it for Christmas! It’s the high-energy Christmas in the Smokies Bluegrass Festival 2015, with a number of acclaimed artists joining Lorraine and the band. Check our Christmas Bluegrass write up from last year and see the Christmas in the Smokies event website.